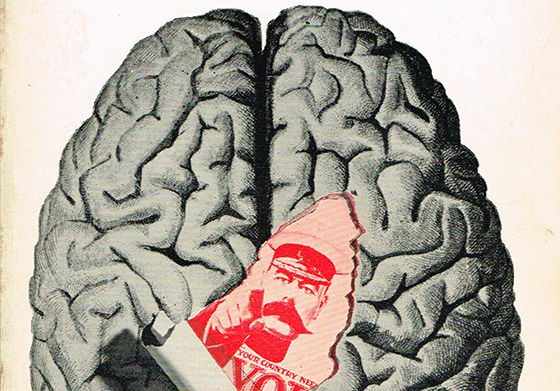 Persuasion isn’t about brainwashing or propaganda – it’s about understanding what makes your prospects tick. Image source. Since the publication of Influence: The Psychology of Persuasion in 1984, Robert Cialdini’s six principles of persuasion have become an integral part of the marketing world’s vernacular. If you regularly read marketing blogs, you’re likely familiar with them: reciprocity, commitment and consistency, social proof, authority, liking and scarcity. And while most people are familiar with social proof, all six of Cialdini’s principles can be used to make your landing pages more persuasive and take your conversion rates to new heights. In this post we look at each of Cialdini’s principles of persuasion and show how they can help you optimize your landing page to generate substantial conversion lifts. Whether you’re creating new landing pages or are looking to improve the performance of your existing campaigns, you’ll see how making your copywriting more persuasive can turn losing pages into winners and make winning pages top performers. The principle of reciprocity is based on the idea that people’s natural instinct is to return a favor. In 1985, Ethiopia provided thousands of dollars in humanitarian aid to Mexico in the wake of an earthquake. Though Ethiopia was in the midst of their own famine and civil war, this aid was reciprocation for the diplomatic support Mexico provided for them when they were invaded by Italy in 1935. 50 years later, in dire straits, the power of reciprocity moved the leaders of Ethiopia to pay back Mexico’s generosity. Obviously, when dealing with landing pages, reciprocation happens on a much smaller scale, but the basic facts hold true – ­people will feel the pull of repaying even the smallest acts of kindness. 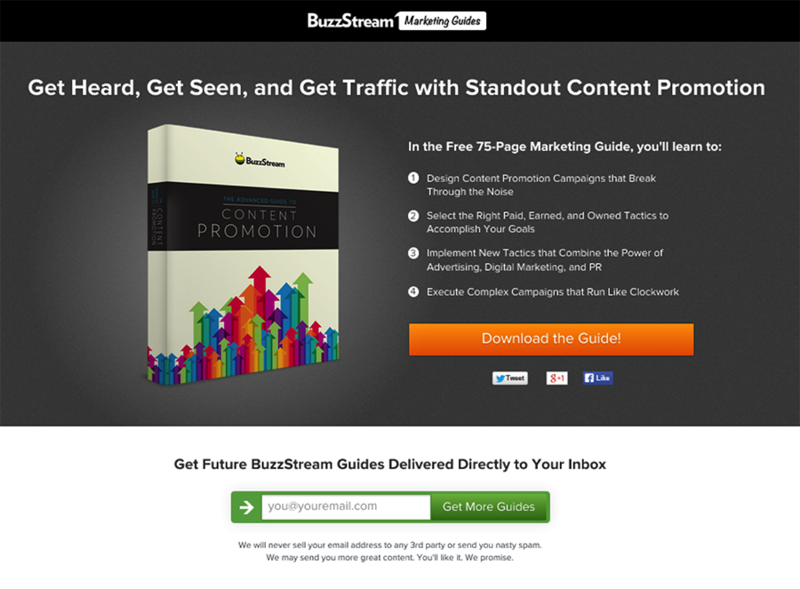 The email opt-in at the bottom of the page is optional, and BuzzStream relies on the fact that prospects who accept their free gift will be more likely to reciprocate with their email address. Matt Gratt, Senior Marketing Manager at BuzzStream, told me that by giving away the resource for free, far more people were willing to link to the guide and mention it ­– it was featured on Moz’ popular Whiteboard Friday video series and linked to from several other sources. Noah Kagan puts the power of reciprocity to work with many of his blog posts, offering premium items associated with the content in exchange for registering. For example, this post about how to be a #1 best seller on Amazon walks readers step-by-step through the process, with detailed screenshots, stats and more. At the end, readers are offered additional bonus content in exchange for providing their email address. After reading so much detailed information, the principle of reciprocity coupled with self-interest creates a very compelling opt-in offer. The free tool allows users to enter their details to receive a score between 1 and 100, based on their implementation of blogging, social media, SEO, lead generation and mobile optimization. 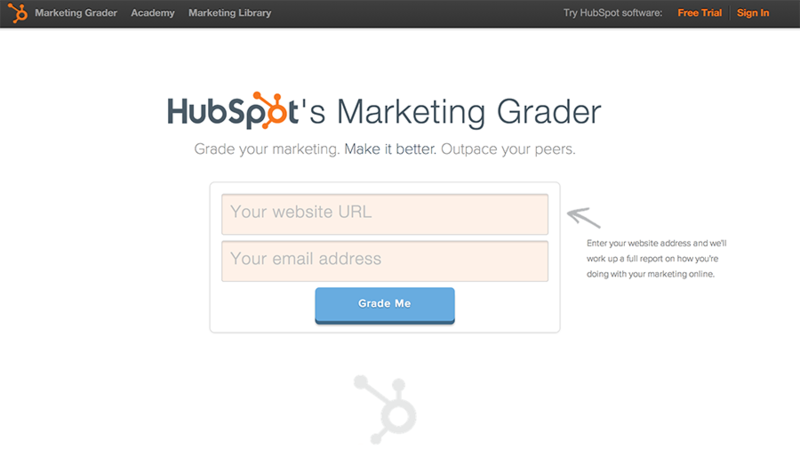 As with BuzzStream, HubSpot provides their Marketing Grader tool free of charge. Reciprocity seems to have served HubSpot well — within the first three years of use, HubSpot’s Website Grader (an earlier version of Marketing Grader) was shared many times over and has analyzed over 2 million websites. Give something away for free first. Offer great value in exchange for the visitor’s commitment. People take a lot of pride in being true to their word. Cialdini suggests that both oral and written commitments are powerful persuasive techniques and that people tend to honor agreements even after the original incentive or motivation is no longer present. Commitment is a powerful #persuasion technique even after the original incentive is gone. If you’ve ever been to a car dealership to buy a new car, you’ve likely seen this in action. After a test drive, you’re often escorted back to the sales office to negotiate the terms of purchase. One of the first things you’re asked to do is to either write down the terms you want or initial the terms written by the sales person. These terms aren’t final and aren’t official, but the simple act of writing them down and initialing them is a small commitment used to propel you toward making increasingly larger commitments (culminating in committing to buy the car). Beginning with this mini-commitment (coupled with a declarative statement) makes people more likely to follow through with the daunting twenty-minute application process. 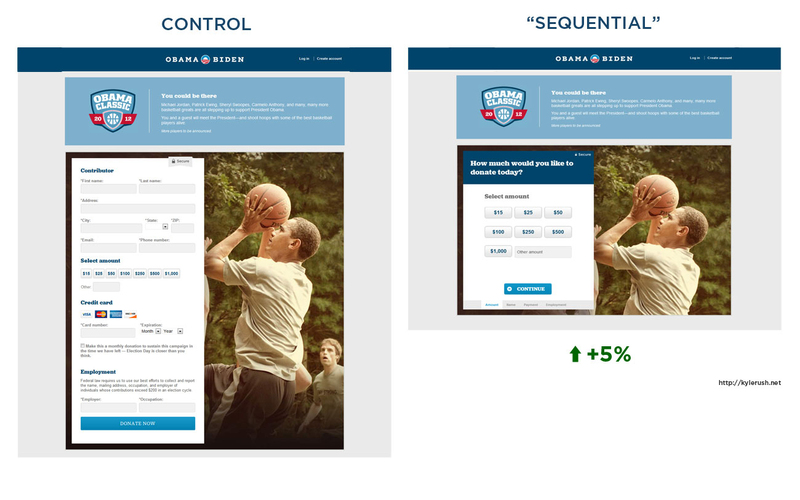 The Obama campaign was able to leverage the principle of commitment and consistency with the famous redesign of their donation form. By breaking the donation process up into sequential steps, the campaign increased donation conversions by 5%, collecting millions of incremental dollars. This redesign was effective in part because of their strategic use of commitment and consistency. The first step in the process was to get the user to select the amount of money they wanted to donate. The “sequential” process (right) started with asking the user to select the amount of money they wanted to donate. Image source. This first step got them to commit early on in the process, even with several screens left to go in order to actually complete the donation. People like to see themselves as consistent and rational – getting started with the donation amount committed them to finishing what they had started. You don’t have to redesign your entire landing page flows to take advantage of the principle of consistency. If your conversion process is long and complicated, mini-commitments featuring positive, declarative statements (as in the mortgage example above) can go a long way toward getting users invested. Ask for a very small commitment upfront. Break up your “asks” into manageable steps. Social proof relies on the idea that, in moments of uncertainty, people naturally do things they see others doing. Cialdini cites an experiment in which researchers participating in a door-to-door charity campaign found that people were more likely to donate when the list of prior donors was longer. If that list included people that the prospective donor knew — for example, friends and neighbors — then he or she was even more likely to donate. Control version with three testimonials in rotation. Image source. Test version with static image reading “Thanks to our 600,000+ Facebook fans.” Image source. That one simple change resulted in a 44% lift in sales for the online florist. Leads who saw that daFlores had upwards of 600,000 fans probably felt that they were a great company that provided great services. That’s the power of social proof. But as this example shows, social proof can be a double-edged sword. When you have weak, fake or vague testimonials, social proof can actually work against you. Even if a testimonial is real but feels fake, it can act as negative social proof and turn visitors away. What most people forget about Cialdini’s principle of social proof is that it works best when the testimonials are from people similar to your target customer. You need to provide convincing demonstrations of social acceptance by your visitors’ peer group to get them to follow the crowd. Use convincing testimonials from people who are similar to your target customer. Use badges to highlight popular product and pricing choices. In his book, Cialdini notes that people tend to obey authority figures – even when asked to perform objectionable acts. As an example of this, he cites the infamous Milgram experiments in which subjects essentially torture another person with electric shocks simply because they’re told to do so by an authority figure. This tendency to respect authority figures is frequently leveraged in the sale of everything from shoes to toothpaste. Ultraviolet Digital was able to get their client Kaya Skin Clinic a 22% increase in sales by simply reworking their CTA. Control version with generic CTA. Image source. Though it appears in the copy above, Ultraviolet Digital found that including the word “expert” in the opt-in form as a call to action was a much more powerful application of the law of authority. The opt-in form’s title, “I want an expert opinion. Sign me up!” appeals to the principle of authority. This variation out-performed the control by 137%. Image source. In this example, specific authority isn’t even necessary – just the emphasis on of the word “expert” makes the page 137% more effective at capturing leads. Even if you think you’ve already applied the principle of authority to your landing page, the example above shows that sometimes, more is better. Consider how you might be able to re-emphasize or play up authority to further boost conversions. Use an authority figure respected by your visitors (generic or not) to get visitor to take action. Cite and reference experts and trusted institutions. 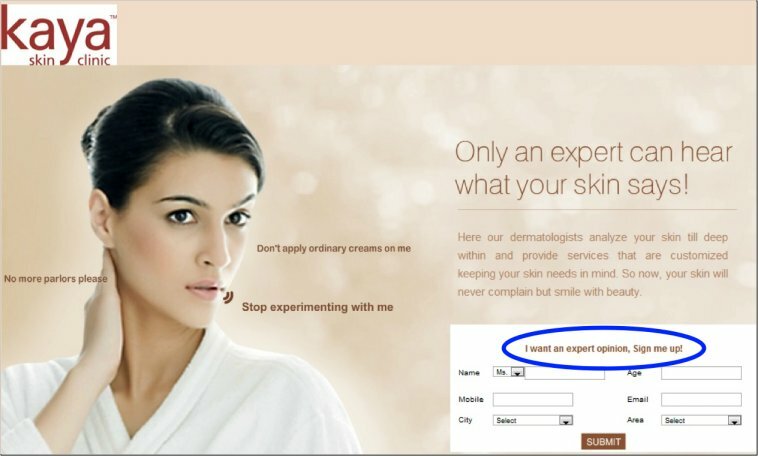 For a sophisticated analysis of how and when to use expert testimonials on your landing page, check out this article. According to Cialdini, Tupperware parties (Influence was, after all, published in the ‘80s…) are evidence of the fact that people are more likely to buy if they like the person selling to them. This law includes biases toward people who are more attractive. Aside from simply including visuals of attractive people (which doesn’t make sense for every product), this principle can be one of the hardest to pull off in an online environment. Still, that doesn’t mean you can’t use the principle of liking to improve landing page conversions. Airbnb used the principle of liking to reengineer their “underutilized and underperforming” referrals program to increase the program’s user signups and bookings by over 300% per day. Click for full-length image. Image source. Rather than a random listing alongside the Airbnb logo, potential users see (and thus associate Airbnb with) the smiling face of a friend. 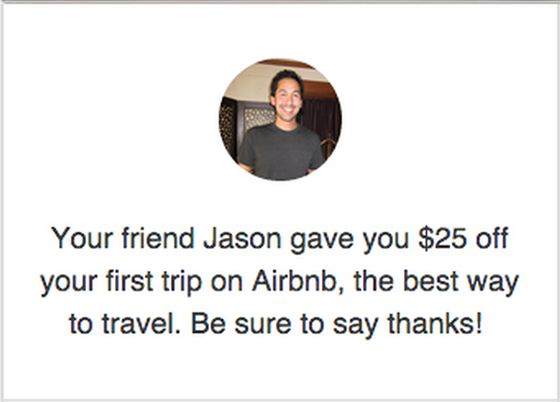 For the prospect, initial exposure to Airbnb happens with a personalized landing page and referral code. What’s not to like about that? Similarly, by combining conversational copy and a friendly face, the customer support service Help Scout uses the principle of liking on the page below. 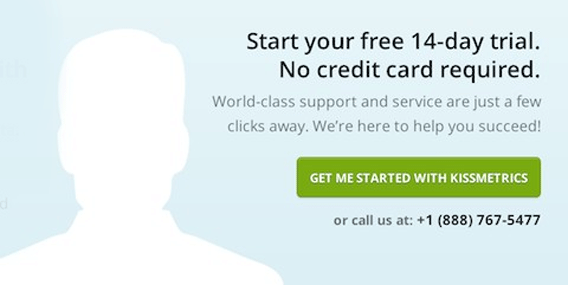 Help Scout is a lightweight customer support tool favored by startups. Their page incorporates a smiling person to draw on the principle of liking. In this case, the person isn’t even a friend – just a real person to whom visitors can relate. Note that the principle of liking isn’t limited to visual elements. The page copy below and beside the photo is casual and conversational, further serving to humanize Help Scout. Keeping landing page copy friendly is just one of several ways to use the power of liking to your advantage. Another involves playing up similarity, since people tend to like those with whom they have something in common. Thinking of who your target user is and their values, hobbies and interests can help to bridge the gap and boost likability. Use images of friendly people who belong to the same demographics as your site visitors. Use conversional copy that speaks your visitors’ language. Relate to your visitor so they feel like they’re with people just like them. According to Cialdini, scarcity (whether actual or merely perceived) generates demand and thus compels customers to act quickly. The abundance of “limited time offers” and the inclusion of expiration dates on vouchers and coupon codes seems to support this. Though there was no difference in sign ups between the 30-day and 14-day trial periods, it turned out that people were 102% more likely to actually use the product when they only had 14 days to do so. Despite the conversion rate staying the same, greater engagement allowed more people to find value in the product, ultimately increasing revenue as more users actually tried the product and chose to convert from free trial to paid. Hiten’s business partner, Neil Patel, uses the countdown clock on landing pages for his Quick Sprout University. With such a great deal on the line, the pressure is on to make a purchase or lose out forever. This fear of missing out is the driving force behind the scarcity principle. Scarcity leverages fear of missing out to #persuade leads to take action. In the example above, potential customers who were given too much time never bothered to use their free trials. Consider ways in which you might be able to frame your own offerings with scarcity, thereby boosting engagement and conversions. Make offers limited in terms of time or quantity. Use countdown clocks to draw on people’s fear of missing out. What many of these case studies have in common is that the changes weren’t drastic. Even minor changes – when informed by the proven psychological principles and real insights into your customers – can result in huge wins. Minor changes informed by psychology & customer insight can result in major #conversion lifts. Look at your existing landing pages and channel your inner Cialdini. What are the easy tweaks you can make right now to tap into the psychological power of the six principles to drive more conversions for your landing pages? Have a favorite conversion tactic that uses one of Cialdini’s principles? Let me know in the comments. Sean Ellis is the CEO of Qualaroo and founder of GrowthHackers.com. Prior to Qualaroo, Sean held marketing leadership roles with breakout companies including Dropbox, LogMeIn (IPO), Uproar (IPO), Eventbrite and Lookout. 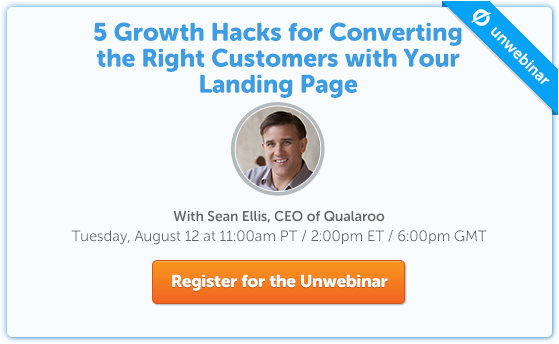 You can follow Sean on Twitter: @SeanEllis and read Qualaroo's Beginner's Guide to CRO.